Voor wie: masseurs en dansers! Massage therapists know the body of their clients, dancers know their own body. Where they meet and a new movement arises. Where does a meeting of two bodies' ends and a contact improvisation dance begins? Where does a bodywork therapy ends and a journey of two bodies begin? In this workshop we will try to see the similarities and differences between contact improvisation and a session of bodywork and massage. Traditionally a workshop of contact improvisation ends with a bodywork session. The dancers, many of them professional body therapists, share their knowledge of relaxing the body and massaging the muscles and joints. In this workshop we will learn and explore the principals of moving another body without effort and being moved without unnecessary tension. This workshop is not about the high physicality or acrobatic side of contact improvisation, nor is it about the “choreography” of a specific massage session, but rather on the exploration of what happens in the body when it is being touched in different ways and manipulated into movement, what are the principals behind a treatment and the meeting point between two bodies – therapist and patient. What happens in the body of our partner, but also and as important, what happens in our own body as we move into physical contact. Tom Goldhand is a dancer and a dance teacher and maker in the field of Dance Improvisation and Contact Improvisation, Tom holds a Master degree in Dance therapy from Codarts University and is a certified body therapist (Ilan Lev method). 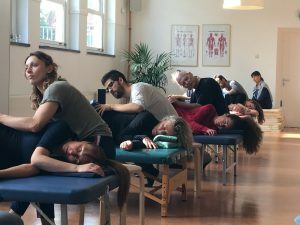 In the last 5 years he works as the movement teacher in the "Akademie voor Massage en Beweging" in Amsterdam. Click here for Tom's website.